The lowly cherry pitter- one of those handy little gadgets you wonder how you can do without twice a year. I recently bought a plastic “designed to last a couple of hours of cherry pitting” tool that honestly works hard so I don’t have to. It’s worth writing about because last week, I spent one hour googling how to pit cherries with whatever you’ve got around the house. The most popular answer was, “Place the cherry over a small salt shaker opening and use a straw to poke the pit out.” So, I bought three pounds of cherries, lined up straws, a couple of sacrificial salt shakers and a couple of kids. “Pizza for supper if you pit these cherries for me.” It took them two hours, complaints of blisters and a few tears before they finished the batch. I baked the kids their well-earned pizzas, despite their grumbling that that was “THE worst job Mom has ever given us.” Kids today… Not even the story of how I had to butcher a hog after school with a dull kitchen knife. THAT didn’t even soften their hearts. I dried those cherries in my solar dehydrator and am now hoarding the resulting dried nuggets like gold. Talk about intense cherry flavor and chewiness! 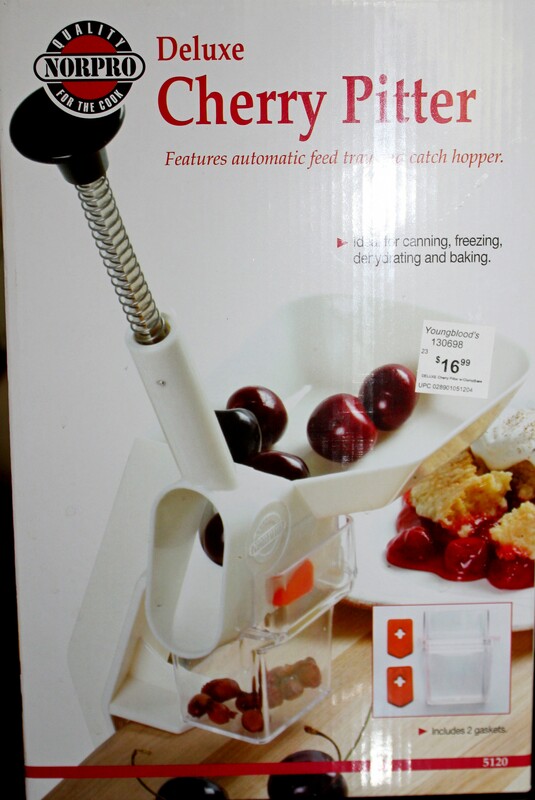 This is what convinced me to shell out eight bucks (after a True Value discount coupon) for a real cherry pitter. All three pounds of pitted cherries are now languishing in my hot Sport solar cooker and I am a happy homemaker. What did I learn from this experience? 1. Sometimes the Internet has really lousy advice. 2. The right tool for the job wins every time. 3. Dried cherries at $20 a pound are worth the effort when you are as crazy about them as I am. Well, I wouldn’t return the mechanical pitter. Use the straws (even with points) as punishment for bad behavior. I don’t think there’s any law against using something like that on rebellious kids… yet. Boredom may make more of an impression than spanking. The one advantage with the straw is that you know you got the pits. With the mechanical ones, there’s no such guarantee. I hate hitting those darn pits! When you forced your kids into Cherry Pitting Slave Labor, did you cut the straws at an angle (to make a point) or just straight across? The point works much better. But I surely do like that three pounds in less than 20 minutes….. I use the pointy straw with a two bowls and a towel on my lap while I watch a video. No speed records, though. Probably three pounds at the end of two movies.